Tu B’Av (15th day of the month of Av), the ancient holiday when young single women of Jerusalem danced in the vineyards hoping to find their mates, is historically a festive day when thoughts of young men and women turned to marriage. Today, Tu B’Av is a popular time for weddings, which are forbidden during the Three Weeks, the traditional mourning period for First and Second Temples in Jerusalem. The Three Weeks culminate in the solemn day of the Fast of Tishah B’Av (9th day of the month of Av); Tu B’Av marks the renewal of the joy represented by marriage on both a personal and communal Jewish level. The Temple was destroyed; nonetheless Jewish life, symbolized by Jewish marriage, will continue on an individual and thus on a national level. This ketubah, a marriage certificate, Certificado Matrimonial, in Aramaic with a Ladino translation, symbolizes Jewish continuity in the new world. It may have been designed specifically for use in Cuba in the early twentieth century, since the second line states: “Kubah, Amerikah,” and the first line provides a blank space for the date with the opening year of “56—“ ; indicative of the Gregorian calendar dates ranging from 1840 to 1939. Despite the possible date range, the decorative style of the ketubah points to the first part of the twentieth century, coinciding with the primary dates of Sephardic Jewish settlement in Cuba, from World War I through the 1920s; additional evidence for dating the ketubah to the first two or three decades of the twentieth century. Sephardic immigration to Cuba increased after World War I as the result of the disintegration of the Ottoman Empire; Cuba was an attractive destination since the Spanish language was related to Ladino and Cuba had a liberal immigration policy at the time. The printer of the ketubah is unknown. 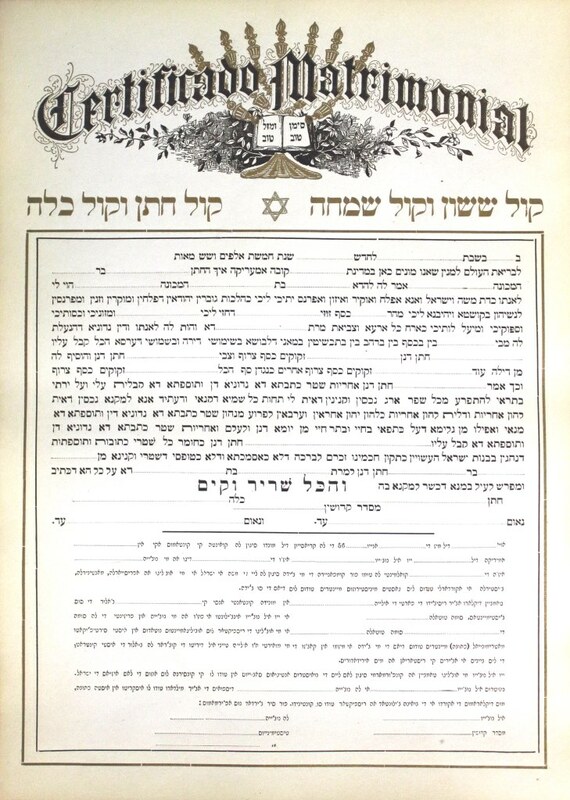 The ketubah is part of the Ladino collection in the Sephardic Reference Room.